Transverse lines of the fingernails. (A) Beau’s lines (arrows) of the thumbnail. (B) Mees’ lines (arrowheads) of the thumbnail. Four distinct, transverse, depressed lines (Figure, A) developed on the fingernails of a 73-year-old man with castration-resistant prostate cancer after 4 cycles of docetaxel-based chemotherapy; the lines were parallel and evenly spaced (Beau’s lines). 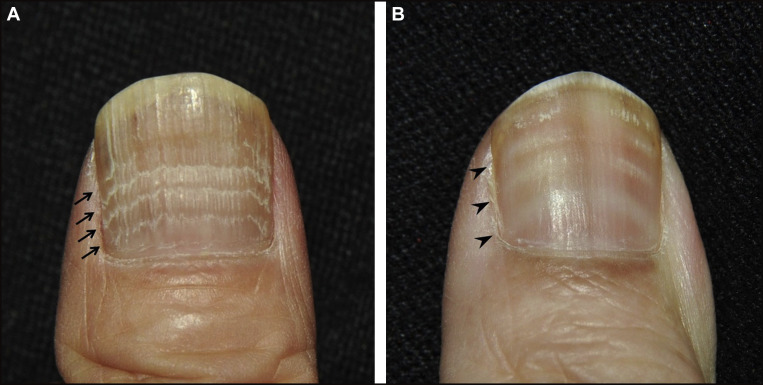 Three transverse white bands (Figure, B) appeared on the fingernails of a 62-year-old woman with recurrent metastatic soft tissue sarcoma after 3 cycles of chemotherapy with vincristine, ifosfamide, and doxorubicin; the nail surfaces were smooth, and the bands did not fade with digital compression (Mees’ lines). Transverse lines of the nails can be caused by a growth arrest in the nail matrix or changes in the color of the nail itself, and may suggest underlying systemic conditions or the effects of a toxin or drug.1, 2 Beau’s lines are a typical sign of acute toxicity to nail matrix keratinocytes, resulting in a transient arrest in nail plate production. The nail develops a transverse linear depression that moves distally as the nail grows.3 In Mees’ lines, change occurs in the color of the nail without the cessation of nail matrix growth. Mees’ lines are easily differentiated from Muehrcke’s lines, which are apparent leukonychia and paired white lines caused by vascular congestion in the nail bed, because Muehrcke’s lines fade with digital compression.2, 4 An adverse reaction resulting from chemotherapeutic agents should be considered when transverse lines are seen on the nails, including Beau’s lines and Mees’ lines.